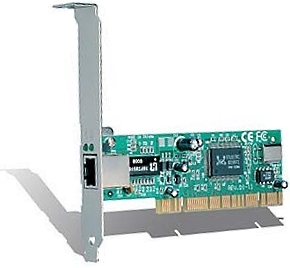 A Network Interface Card (NIC), sometimes called a "network adapter" or "LAN adapter" is an expansion card that allows a PC to connect to a network. Though there are many different types of networks, PCs almost always use a NIC that interfaces to a wireless network or an Ethernet network. connect an Ethernet network cable. Every NIC is identified on the network by a unique 48-bit serial number called a MAC (Media Access Control) address, which is stored in a ROM on the card. The MAC address is unique because NIC manufacturers purchase blocks of addresses from the IEEE (Institute of Electrical and Electronics Engineers). In the past, if you wanted a PC to be able connect to a network, you needed to install a NIC. Today, most motherboards have Ethernet network circuitry built into the motherboard. However, if a PC needs multiple network interfaces, for example to have it function as a firewall or gateway.